Netflix has announced that the company has reached a deal with Marriott Hotels to provide entertainment for the hotel chain’s guest rooms. Many hotels have found that their guests regularly stream video from services like Amazon Instant Video, Hulu Plus, and HBO Go while they’re in hotels. Over the past few years, streaming services have surged while traditional television viewing has declined. Marriott says that the Netflix app will be added to the in-room television sets in several hotels initially, with the program being rolled out to other locations over the next 18 months. In-room TV Netflix access is only available in six Marriott hotels currently. Those include hotels in New York; San Jose, California; and Bethesda, Maryland. Marriott plans to have Netflix available in nearly all of its 300 hotels in the US by the end of 2016. 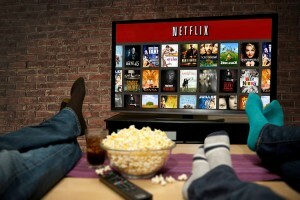 The customers will be able to sign into their own Netflix accounts to stream the shows they want to view. After signing in once, the customer will remain signed in for the duration of their stay unless they choose otherwise. Guests are automatically signed out of their accounts when they checkout. Being able to sign into their own allows lets the guests start their shows where they left off and see the Netflix recommendations for them based on their previous viewing history. The deal will be beneficial for both companies. Being able to stream Netflix’s popular shows on in-room television sets instead of on tiny mobile devices or laptops is a big advantage for Marriott’s customers. Guests may find Marriott hotels more attractive now that they can watch Netflix on the biggest screen in the room. Hotel chains have recognized the importance of adding to the customer experience at specific properties. Some offer pokies free games as a way to lure more customers. Marriott guests that aren’t yet Netflix members can sign up for the streaming company’s free 30-day trial and try out the service while staying at the hotel. Netflix is optimistic that the deal will help increase the number of subscribers to its streaming service. There are currently more than 40 million paying Netflix members in the US. Netflix’s stock has more than doubled over the past year. The company’s stock is now worth about $692 a share, rising swiftly from a low of around $60 per share in late 2011.